Flash chromatography is a cost-effective separation method which is used for cleaning and extracting raw materials in synthesis chemistry, combinatory chemistry and also in pharmacokinetics. The normally used broken silica gels often display limited efficiency. Very high and strong fluctuating metal contents of the silica matrix in different batches can influence a separation considerably and have a negative effect on the reproducibility. Through an improvement in selectivity and by using spherical silica gels like VDSpher Flash phases, the separation efficiency and therefore the capacity can be increased significantly. 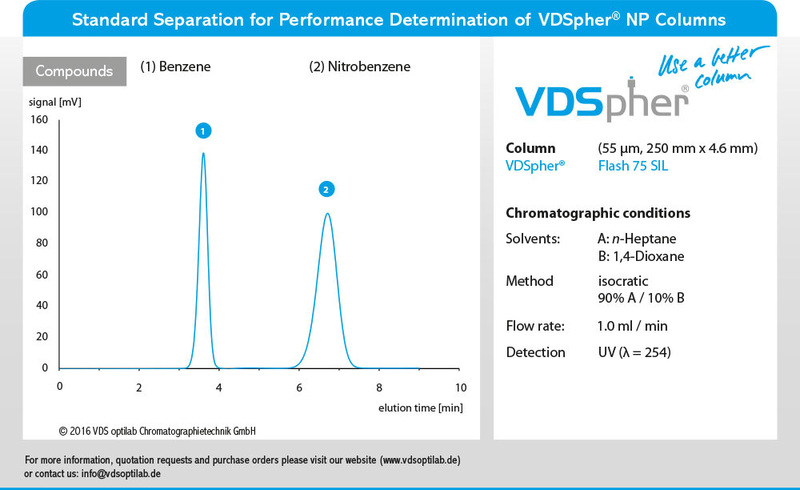 The VDSpher Flash phases are characterised by low back pressure, controlled low metal content, narrow particle size distributions and low costs, i.e., a very good price/performance ratio: A narrow particle size distribution with low fine-particle proportion provides a good resolution and therefore a high capacity of the filled flash chromatography column at a low back pressure. In the context of selectivity, the phases listed in the table correspond to the comparable phase modifications of VDSpher phases for the analytical HPLC (reference columns with smaller particle sizes are available on request). This enables a simple upscaling from HPLC to flash chromatography. VDSpher Flash AP is ideally suited in the normal phases mode as special amino phase for the cleaning of base compounds, in the RP mode (HILIC) for sugar separations and they can also be used as adsorbents (metal scavengers). A primary and a secondary amine are linked in the phase VDSpher Flash DAP. This results in a higher ion-exchange capacity. When working in the normal phase mode, there are shorter retention times as compared to the VDSpher Flash AP phase. In addition to the particle sizes listed in the table, VDSpher Flash bulk materials with a particle diameter of 120 µm (70 - 170 µm particle size distribution) are also available.